The Q Cookbook. : Celebrating 80 years of Queenwood. Recipes, Artwork, Writing & Submissions by the Families of Queenwood. (Crown & Anchor Printery, 2005).. Lge. 4to; pp. 191; illustrated endpapers, numerous colour illustrations; illustrated slick boards, dent to board, otherwise a fine copy. 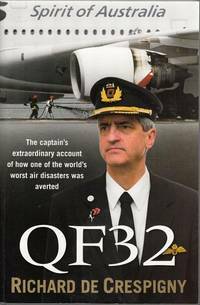 QF32: The captain's extraordinary account of how one of the world's worst air disasters was averted. Qantas Rising. : The Autobiography of the Flying Fysh. Sydney, Angus & Robertson, 1965.. Lge. 8vo; pp. xii, 296; portrait frontispiece, 42 b/w. plates, 1 double-page map, appendices, index; chipped dustjacket, good copy. The Quality of Mercy. 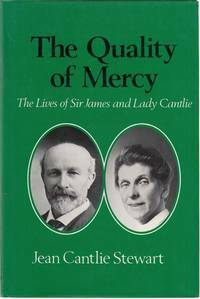 : The lives of Sir James and Lady Cantile. London, George Allen & Unwin, (1983).. 8vo; pp. viii 277; list of illustrations, notes and references, bibliography, index; original cloth, rubbed dustjacket; minor flecking to top edges of pages, spine of cloth bumped; otherwise a very good copy. (Wholly set up and printed at The Registered Office Of The "Boort Standard And Quambatook Times", Vic, 1971).. First Edition; 8vo; pp. 80; b/w illustrations; stiff stapled illustrated wrapper, minor chipping to edges, otherwise a very good copy. Quantity of Water Consumed in Irrigation. : [Read 20th April, 1882]. Royal Society of Victoria, n.d. (c. 1882).. 8vo; pp. 24; numerous b/w tables, appendices; original stiff printed sewn wrapper, minor browning to page edges, otherwise a very good copy. Quarantine Station Point Nepean Portsea. 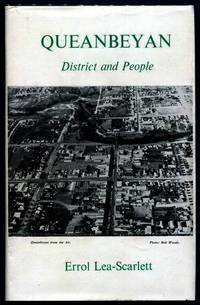 Nepean Historical Society, (1968).. Sm. 4to; pp.11; stiff stapled wrapper, a fine copy. 8vo; pp.11; stiff stapled wrapper. Melbourne, The Craftsman Press Pty. Ltd. (1968). Quarantined: Exploring personal accounts of incarceration in Australian and Pacific quarantine stations in the nineteenth century. : Contained in The Journal Of The Royal Australian Historical Society. Vol. 91, Part 1. June 2005. NSW, Royal Australian Historical Society, 2005.. 8vo; pp. 1-14; original stiff illustrated wrapper; wrapper spine faded; otherwise a fine copy. Sm. 4to; pp.11; stiff stapled wrapper, previous owner's name on verso front wrapper, a good copy. n.p., n.d.
Melbourne, The Craftsman Press Pty. Ltd. (1986).. Reprint; 8vo; pp.11; stiff stapled printed wrapper, a fine copy. Quarry And Stone. 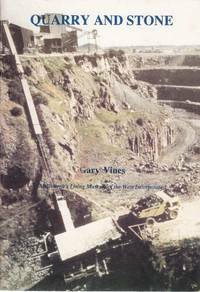 : Bluestone quarrying, stonemasonry and building in Melbourne's West. Melbourne, Living Museum of the West Inc, 1993.. 8vo; pp. 32; profusely illustrated; references; stiff illustrated stapled wrapper; minor browning to wrapper and pages, minor marks on wrapper, otherwise a very good copy. A Quart Pot On My Saddle: Collected Verse by Betty Casey. Illustrated by Pixie O'Harris And Joyce Abbot. Sm. 8vo; pp. 64; illustrations within the text, original green cloth, title and illustration in gilt on front board, milar dustjacket, silverfish damage to cloth and dustjacket, letter to previous owner loosely inserted, a good copy. Sydney, Dymock's Book Arcade, n.d.
Quartered Safe Out Here. : A Recollection of the War in Burma. Harvill an imprint of HarperCollins Publishers, (1992). First Edition; 8vo; pp. 335; glossary; hardback, dustjacket, a fine copy. Quarterly Essay. : Girt By Sea. Australia, The Refugees and the Politics of Fear. QE 5 2002. 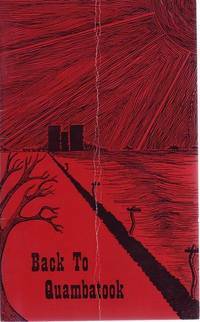 Melbourne, Black Inc, (2002). . First Edition; Lge. 8vo; pp. vii, 106; original stiff illustrated wrapper, minor marks to wrapper, otherwise a very good copy. Also Includes 'Rabbit Syndrome' Correspondence- Tony Abbot, Dennis Altman, Don Anderson, Jim Hammerton, Noel Hutchison, Peter Pierce, Don Watson. A Quarterly For Bookmen: Spring 1936 Volume I New Series Number 4. 8vo; pp. (vi), 487-644; 5 illustrations, the crows nest & advertising announcements with notes on contributors (19 pp. 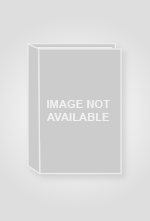 ), index; illustrated papered hard boards lightly browned. New York, Pynson Printers, 1936. A Quarterly For Bookmen: Winter 1936 Volume I New Series Number 3. 8vo; pp. (vi), 323-480; 6 plates, notes and queries, the crows nest & advertising announcements with notes about contributors (15 pp. ); illustrated papered hard boards, chipped on corners and slightly browned. New York, Pynson Printers, 1936. Queanbeyan Municipal Council, 1968.. First Edition; 8vo; pp. xiv, 296; illustrated endpapers, portrait frontispiece, 16 pages of plates (40 illusts. ), appendix, abbreviations, notes, bibliographical note, index; original full leather presentation binding, minor damage to dustjacket; otherwise a fine copy. The Queen Adelaide Club. : 1909-1982.A history of the Club to mark the seventy-fifth anniversary. (Adelaide, The Queen Adelaide Club, 1984).. First Edition; 8vo; pp. (viii), 65, (11); sketch frontispiece, b/w illustrations; original navy cloth, title in gilt on spine, illustration in gilt on front, a fine copy.